Dwarfed by the majestic scenery and bathed in a pool of sunlight, the Schloß Hohenschwangau sits on a hillside between the ‘Alpsee’ on the left and the smaller ‘Schwansee’ on the right. 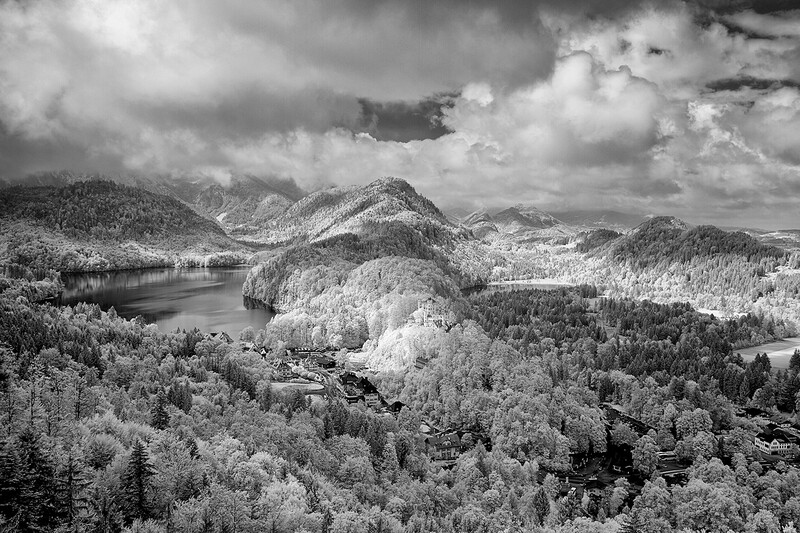 This image was shot from a viewpoint along the road leading to Schloß Neuschwanstein. Built in a neo-Gothic style by Maximillian II, King Ludwig II’s father, this was where the young Ludwig grew up and lived for much of his life. It was here that Ludwig first met Richard Wagner and many of the rooms are painted with scenes from his opera Lohengrin.